Allow us to share the joy and excitement of a Freeport fishing excursion with the island’s most experienced and dedicated team of fishing captains. Captain Tom Folley and his crew of native fishing captains are ready to show off how awesome the fishing in the Bahamas really is! For guests visiting the vacation destination of Freeport and Grand Bahama Island, we have some of the country’s most top-rated offshore fishing charters ready for you enjoy! You can enjoy all kinds of fishing in Freeport, including bonefishing, reef fishing, and even spearfishing. We offer you on the most experienced, knowledge, and professional of charter captains to take you out to the absolute best places for fishing. 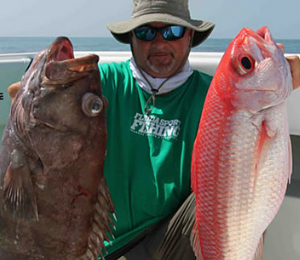 When it comes to offshore fishing, we know you want to go big or go home! So we take you out to deep blue offshore waters a few miles off the coast of Freeport to go after those big catches! We’re talking marlin, sailfish, tuna, snapper. Our guides have decades of experience catching these awesome sport fish. And they are ready to share their techniques and skill with you. The best part of fishing in Freeport is that you don’t even have to go that far off shore to catch some big fish! These waters of the Atlantic Ocean are teeming with all kinds of large fish species throughout the year. It isn’t like other fishing destinations where there is an “on” season and an “off” season. Here in Freeport, it is always fishing season! The fish will always be biting! That is what makes Freeport, and the Bahamas in general, such a popular fishing destination. When you go fishing here, your chances of catching multiple fish are extremely high! Plus, mix in the year-round warm tropical weather, and you have a fisherman’s dream come true. Your Freeport offshore fishing charter comes fully equipped with high quality fishing gear and you go out on a comfortable and sleek 32-foot Sea Craft. What is the length of a full day versus a half day trip? Full day trips are approximately 8 hours and half day trips are approximately 4 hours. I have been to the Bahamas many times, but Folley & Sons Freeport Offshore Fishing is one of my favorite trips! It includes everything that everyone should do here. As a Bahamas veteran, I can say only the best about this experience!